Terrance Stanley "Terry" Fox, CC (July 28, 1958 – June 28, 1981) was a Canadian humanitarian, athlete, and cancer treatment activist. He is considered one of Canada's greatest heroes of the 20th century. Terry Fox was born in Winnipeg, Manitoba, Canada and was raised in Port Coquitlam, British Columbia, Canada. After losing his leg at age 18 to osteogenic sarcoma, the young athlete decided to run from coast to coast in order to raise money for cancer research. Beginning by dipping his artificial leg in the Atlantic Ocean at St. John's, Newfoundland on April 12, 1980, he aimed to dip it again in the Pacific Ocean at Vancouver, British Columbia. His pace was daunting. He ran an average of 42 km a day — the distance of a typical marathon. The Guinness Book of World Records lists Rick Worley as the marathon record holder: he ran 200 straight marathons, but over 159 consecutive weekends, not days. No one had ever done anything similar to the task Fox was undertaking. He could not finish his run, however, as the cancer spread to his lungs and he was forced to abandon the course on September 1, 1980 just west of Thunder Bay after running 5373 km over 143 straight days through Newfoundland, Nova Scotia, Prince Edward Island, New Brunswick, Quebec, and Ontario. He died several months afterwards at the age of 22. However, his Marathon of Hope captured the nation's attention. He was proclaimed a national hero, and the annual Terry Fox Run events organized all across Canada, in the United States, and in other countries around the world, have raised more than $360 million for cancer research. Terry FoxFox's heroism has inspired other Canadians to similar feats in the name of charitable causes. This has included Steve Fonyo, another runner who also had a leg amputated owing to cancer and who retraced the same route as Fox and then proceeded to complete the run to the west coast in the name of cancer research. A close friend of Fox's, Rick Hansen, a paraplegic athlete, was also inspired to make his own trek around the world in his wheelchair to raise funds for spinal cord injury research. 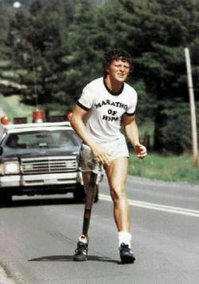 His story is dramatized in the 1983 HBO TV movie, The Terry Fox Story, which the Fox family always has criticized as being too negative as it depicts Terry as having a fiery temper. In 2005 a new movie produced by the CTV television network retold his story, titled simply Terry. Fox was portrayed by Shawn Ashmore. Today, artifacts such as his artificial limb are preserved by the BC Sports Hall of Fame and Museum. In a public opinion poll Terry Fox was voted the most famous Canadian of the 20th century. He was voted number two on The Greatest Canadian list.